Coffee Trail - Counting Stars, Reaching Delphi .✫*ﾟ･ﾟ｡.★.*｡･ﾟ✫*. : And who is this Pianist again? And who is this Pianist again? I recently had the opportunity to spend a weekend with a close friend, Lil Devil and to attend a piano recital by Yiruma, in Singapore. Here, we also took the time to catch up on stories over some very serious coffee tasting sessions. It has been years since I touched the white and black keys and my knowledge is stuck mostly at those few classics I repeatedly played to pass my music exams. Desperate to make up for not being up-to-date (both music & on personal updates), I agreed to go to a contemporary performance. We were indeed mesmerised hearing and watching Yiruma for two hours as he glided effortlessly across those octaves. Here's a secret, as much as I love music, I can’t sing to save my life. If I did sing, I’d be handing Simon Cowell the platter he would so enjoy! I am what you call tone-deaf. These are extraordinary people, with other unique and humbling talents, but singing to pitch is not one of them. Someday, if you want to know more, I will tell you over a drink. The trip to Singapore is a pleasant six-hour bus ride or a 45+ / -minutes flight to Singapore. Options are plenty, depending on your preference. Singapore was part of the Federation of Malaya from 1946 to 1963. To many of us from this region, Malaysia and Singapore are still geographical relatives separated by politics. Singapore is one of the leading economies in this region and offers an array of opportunities. For me, it’s the music! Devil promised me good Singapore local coffee at Ya Kun, in Paragon. The queues here were long and all seats at Ya kun were taken. Many customers were standing behind those seated to reserve their seats next. According to my mate, this is common, and she tells me to be thick-skinned and to do the same. It’s a survival game, she reminded me. Devil is blog-and-camera-shy, but if you look closely at the picture, you will notice she is not hand-shy. She recommended the steamed bread and milk coffee. I ordered a set each thinking it would be more economical for us given the high currency exchange rate but, ended up with uneaten half boiled eggs. That was not too economical after all. The coffee, on the other hand, was hot, not too strong, and just perfect after the long and wet bus journey. 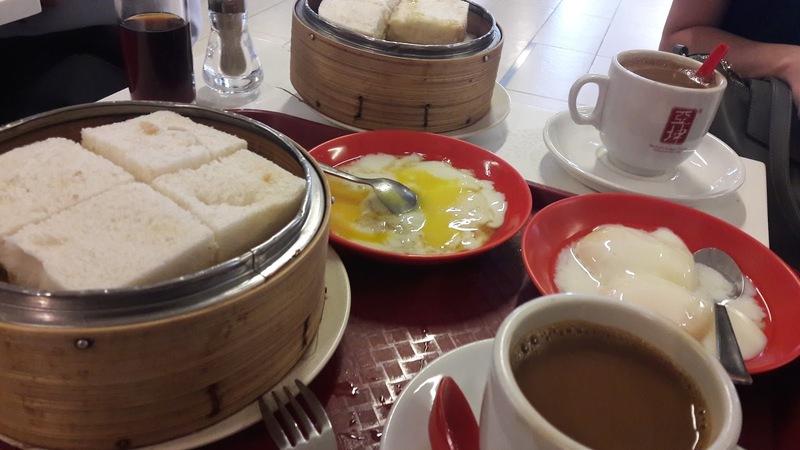 I hadn’t had breakfast nor lunch, and if not for my next early dinner appointment, I would have stocked myself up with more steamed peanut butter and kaya bread. I noticed Ya Kun also served this coffee in a few variations. Classic styled, black or interestingly white with butter. The prices are affordable by the average working-class standards, starting from as low as SGD1.80 for a basic hot coffee. Personally, I don’t like being rushed to finish my cup due to the crowd. Yet I do understand this is not really like those uppity cafes which I rarely visit. Devil was right, the coffee here is a good deal, and I am glad she had this franchise as the first on the list. More on another coffee in Singapore next week. Till then here’s to another great week friends! It was good you could enjoy the coffee. When i was reading this, i was imagining myself in this overcrowded place with some people standing by my table to take my seat. The noise from the crowd and many people moving around make me really irritable. Afterall it was really good you could enjoy your coffee and talk to a friend. Seriously, it was caramel, wasn't it?